​About 26 percent of Pennsylvania households rely on a septic system located on their property to treat their sewage. Most of these homes also have a private well for their drinking water. help protect Pennsylvania’s groundwater, streams, rivers, and lakes. Because of Pennsylvania’s geology, soils, land development patterns, and aging septic systems, there’s a risk of substandard septic systems contaminating our groundwater and surface waters—our streams, rivers, and lakes. When surface waters are contaminated with viruses and bacteria from sewage, swimmers are at increased risk of contracting eye and ear infections, acute gastrointestinal illness, hepatitis, or other infectious diseases. When groundwater is contaminated, it may pollute your own and others’ drinking water supply and spread disease in people and animals. Did you know viruses can survive in groundwater for more than a year? In 2016, the Department of Environmental Protection (DEP) reported that septic system failure was implicated in 202 impaired stream miles and 3,304 impacted lake acres in Pennsylvania. Here are the ins and outs of septic system maintenance to protect your health, your budget, and Pennsylvania’s waters. Who Has Oversight of Your Septic System? In Pennsylvania, local municipalities (for example, boroughs and townships) are responsible for making sure that private septic systems of 10,000 gallons or less meet DEP requirements. Any time you have any questions about an existing septic system or installation of a new system on your property, you should first call your local government office. Many municipalities have a local Sewage Enforcement Officer, who properly sites, permits, and inspects the installation of all septic systems to ensure they meet requirements. Some municipalities also have a sewage management program to make sure property owners perform the necessary maintenance of their septic systems. The heavier solid matter settles to the bottom of the septic tank, where microorganisms feed on the waste and break it down. Lighter fats, oils, and greases float to the top of the tank, forming a scum that may eventually break down or be skimmed during system maintenance. The liquid that remains is still sewage. As it exits the tank, it contains disease-causing bacteria and viruses, as well as other contaminants. Another treatment step is needed before the sewage reaches the groundwater or surface water. The sewage flows through a pipe to a bed of gravel or other aggregate, called a drainfield. Here, it’s dispersed to percolate through the soil for further treatment by microbes. Because of its filtering ability and the microbes it contains, soil is the most important part of a septic system! It is the critical barrier between partially treated sewage and groundwater and surface waters. The type of septic system you can have depends on many factors—soil depth to bedrock or groundwater, how quickly or slowly the water moves through the soil, and the soil type and texture, just to name a few. A general rule of thumb is that the site needs at least 20 inches of good soil. The average lifespan of a septic system is estimated at 15 to 40 years, but it may last longer if properly maintained. Just like changing the oil in your car, maintaining your septic system extends its life for a small cost compared to the expense of installing a new system, which typically runs $15,000 or more. Think at the sink, and don’t overload the commode. Consider what you put down your sink and toilet. Limit the use of your garbage disposal. Avoid using common household items that can clog your system or kill the microbes underground that you need to treat the wastewater. “System Cloggers” -- diapers, baby wipes (even ones marketed as “flushable”), cat litter, cigarettes, coffee grounds, fats, grease, solids, feminine hygiene products and prophylactic devices. “Treatment Killers” -- household chemicals, gasoline, oil, pesticides, antifreeze, paint, and high amounts of anti-bacterial soaps and detergents. Don’t strain your drain. The less water you use, the less your septic system has to work. Stagger the use of water-based appliances, use high-efficiency plumbing fixtures, and repair any leaks in your home. Shield your field. Keep anything heavier than your lawnmower off your drainfield. Divert rain and surface water away from it. Plant trees and bushes away from the drainfield, since roots can clog the field and cause the system to fail. Your local garden center will be able to tell you the likely length of tree and shrub roots. Protect it and inspect it. According to Pennsylvania regulations, solids should be pumped out of the septic tank every three years, or when an inspection shows the tank is more than one-third filled with solids or scum. An inspector will also check that electrical float switches, pumps, and mechanical components are all operating correctly. Your local sewage management program may have more stringent requirements for inspections and pumping. Call the Sewage Enforcement Officer at your local government office for more information. Wastewater backing up or gurgling into household drains. A strong odor or black ooze around the septic tank or drainfield. Bright green grass or spongy conditions appearing on or near your drainfield. If your system is malfunctioning, call your local Sewage Enforcement Officer immediately. The sooner you act, the less pollution will occur and the lower the cost of repair work. With proper operation and maintenance, your septic system will serve your home and help protect the waters of Pennsylvania for years to come. 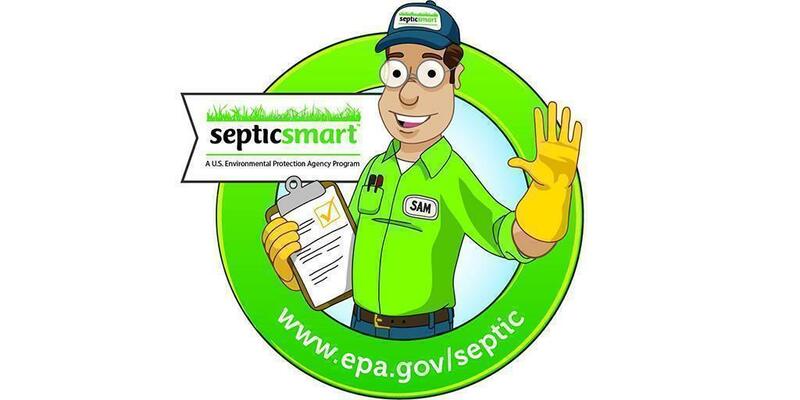 Do your part and be septic smart!